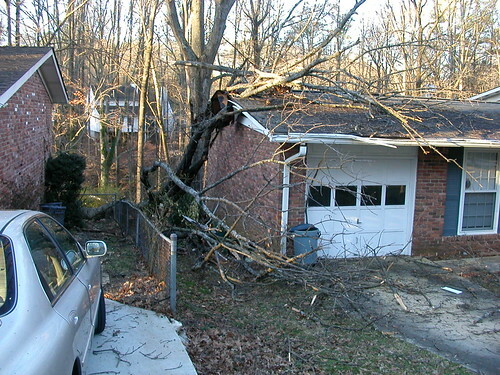 If a Tree Falls on Your Neighbor’s House at 4am, Does Liam Wake Up? So Shannon and I both wake up last night around 2am to the sound of something slamming onto our roof, followed by a bunch of other things hitting our roof and rolling down the side. 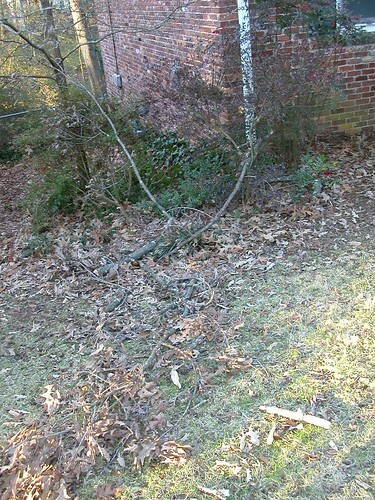 My mind immediately jumps to the small to medium branch that has been hanging in the tree above our house, the one that our home inspector told us last March to have removed as soon as we move in. It looked too small to really cause damage, I thought. I was planning to get around to it sooner or later, too. Yeah, that would be my next door neighbor’s house. And my tree. From the middle of my backyard. Crap! My neighbor wasn’t home, but I called her cell phone and we are working out the details. It looks like her roof is in decent enough shape, but everyone is fortunate that more damage wasn’t done. Miraculously our house was unscathed, despite multiple things falling on it or around it during the windy night last night. Click here to see the rest of the photos / evidence. I am already researching certified Arborists. The “More Liam” set has a few new pictures, too! Liam has a new prescription for “baby Zantac”- although he had previously been diagnosed a “happy spitter”, lately he seems to have continuing digestive problems. He spits up a significant amount of formula, and at times he seems to have discomfort in his stomach / intestines (he will rip a big fart and then feel better). Shannon has acid reflux, which makes it far likelier that Liam will have issues, too. Something like 10% of babies are diagnosed with acid related issues these days. It should take at least a week to have an effect, and we may try a slightly different acid reducer if nothing changes within 2 weeks. In the meantime, Liam has been feeling better the last couple of days after a few days of rough times. When he feels uncomfortable, he goes rigid and gets tall, sticking his legs out as far as they go, and as I mentioned before- he is a tall baby. So it looks like Liam’s hair is going to fall out. 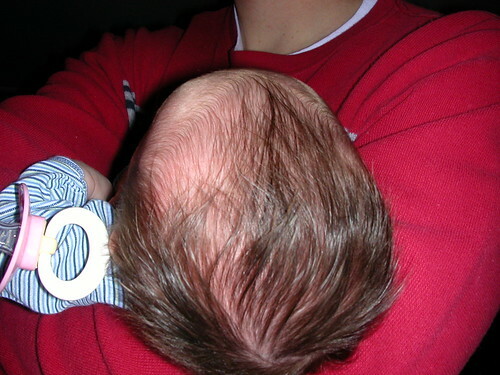 His dark black hair is beginning to recede, and he has a different hairline with a lighter brown, course, short hair. He plans to get an earring and a convertible to compensate. 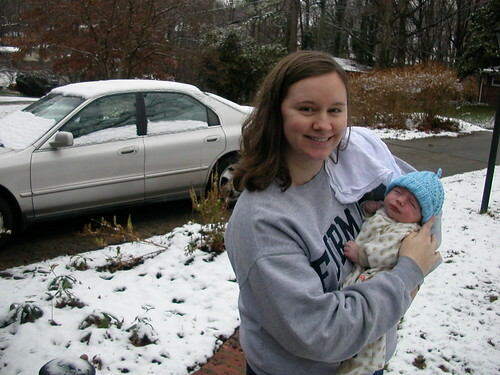 We also got to experience Liam’s first snow! He was thrilled, as you can tell. We spent about 2 minutes outside. 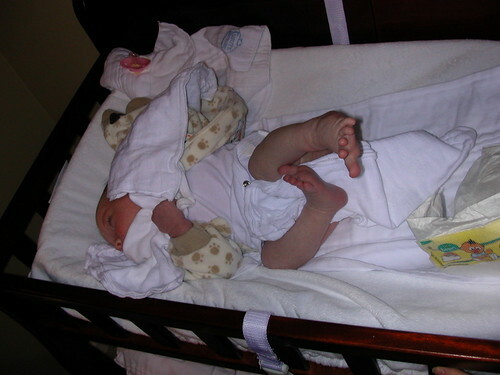 Although we do have the family bassinet, Liam hasn’t quite taken to sleeping on his own just yet. To make sharing our bed a little safer, we got him a little bed that fits snugly in between us. So instead of just me waking up and putting his pacifier back in, we both wake up! He only got poop on our comforter once, so I think we can say it’s been a smashing success. Here is Liam watching the Giants take down Brett Favre and the Green Bay Packers. He can’t believe Eli Manning is going to be in the Super Bowl, either. So rather than force everybody to join Flickr, I will post links to the photo sets that have a built in guest pass. It’s a little easier. Liam is a good baby. He only cries when he is hungry or his diaper needs changing. The only real “problem” we’ve had is with feeding him, which is an ongoing saga. Shannon and I are both committed to breastfeeding, but Liam is slow to take on that one. We had one good feeding in the hospital, with the help of our favorite lactation consultant (ask us about that one). We were unable to have a good feeding by ourselves, and Liam still got very fussy while attempting to latch. After coming home, we weren’t seeing much improvement. We would spend 20 minutes trying to get him to breastfeed, then we would give him formula by dropping it onto one of our fingers that was in his mouth. When we had a legendary 2 and half hour feeding, we knew we needed help. At the recommendation of another DeKalb Medical lactation consultant (they don’t do home visits and Shannon was still not ready to move), we called another lactation consultant (Anne Grider) to come to our home. Anne was very thorough and good at our job. She worked with us for a while before revealing her initial diagnosis: Liam was tongue-tied! 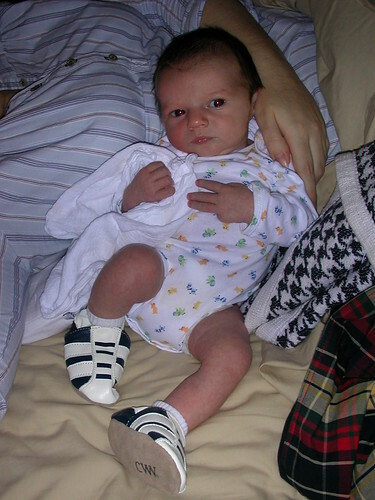 He had a “Simple”, Type 2, case of being tongue-tied, which means that his frenulum (the little piece of membrane that connects the tongue to the base of the mouth) was too short and pulled on his tongue, making it very difficult, if not impossible, for Liam to breastfeed. At Anne’s recommendation, we had a frenectomy performed- a simple procedure where the frenulum is cut after being numbed. Liam was half asleep when Dr. Keith Jackson snipped his frenulum, and he didn’t even flinch! There was hardly any blood and Liam didn’t seem concerned. Since then, Liam’s breastfeeding abilities have greatly improved as well as his bottle feeding. 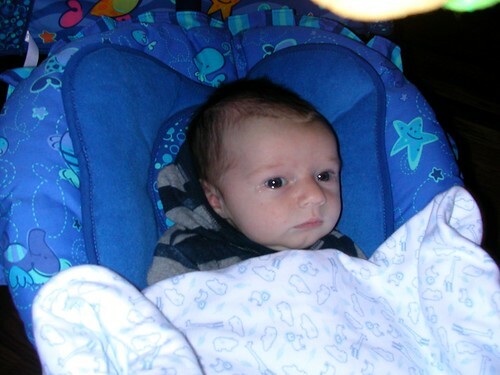 Shannon’s milk supply is still not enough to keep Liam full, so we are continuing to supplement with formula. Shannon is taking a nasty looking herbal supplement called More Milk Plus. Our feeding sessions are still time consuming, and will continue to be so until Liam is able to breastfeed for all his food or we make the hard decision to stop trying to breastfeed and go with the bottle. We’ve been through a lot and so has Liam, so hopefully Shannon’s milk will come in all the way and feedings will become a thing of ease. I just uploaded all of the pictures we have taken with our camera in the past few weeks to Flickr. I know many of you are familiar with Shutterfly, but I recently discovered that Flickr has a way to order to prints as well (pretty much the same price). I prefer Flickr because the photo management tools are better and it’s much easier to organize and find the exact picture I want. If there is enough of an outcry I will consider putting our pictures on Shutterfly as well, but I ask you all to please try Flickr first. As with Shutterfly, you will have to create an account and be approved as “Family” or “Friend”, since we don’t want these pictures open to Joe Schmoe. 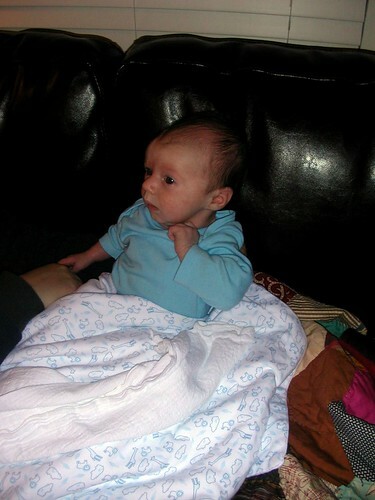 This is the link to the Flickr photoset of Liam’s First 2 Weeks. Update: After following the link, you will need to sign up for a Yahoo! account if you don’t have one already- it will double as your Flickr account. Then, add me (e6matt) as a Flickr contact after clicking here. I’ll get an email letting me know you’ve done this, then I can mark you as a Family member. *Then* you should be able to go back and view the photos. Sorry for all the up front work, but it should be a one-time deal. Future photosets should be easy. Welcome to The Connolly Family Blog! We started this blog soon after the birth of our son, Liam. Shannon and I (Matt) will share stories, news, pictures and video to keep all of you who are interested in the loop. Important news will still be shared via email, but check back here regularly to see what’s happening with us. Whenever we have new pictures or video of Liam we will put them here.